I interviewed John Currey, leader and founding member of Marimba Sol de Chiapas. 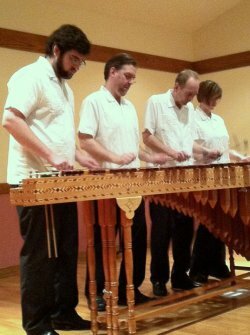 Sol is the only authentic Mexican marimba group in the Midwest, with only a handful in the entire US. Sam Wisman, John Currey, Jim Schank, Laura Lee Crandall perform on the marimba. Photo from Marimba Sol De Chiapas. I write for the love of words and the process of telling a story, juggling motherhood and sanity. I’ve written for The Kansas City Star, KC Studio, The Pitch, KCUR, Kawsmouth and KCMetropolis. Currently working on my fourth children’s book, my first collection of poetry and my first non-fiction book. art books criticism dance display food jazz Kansas City Ballet Kansas City Symphony kawsmouth kcmetropolis.org KC Studio KCUR Lyric Opera of Kansas City music New Ink new music opera poetry radio review sandwiches theater The Kansas City Star The Pitch Uncategorized Welcome! I only got to spend about 45 minutes with my son today between getting home from school and going to work, but it was a good 45 minutes. Earth Day reading with Pulitzer Prize winners. Mary Oliver: Of course! the path to heaven / doesn’t lie down in flat miles. / It’s in the imagination / with which you perceive / the world, / and the gestures / with which you honor it. Annie Dillard: I am really here, alive on the intricate earth under trees. KCUR | Her Art: Who Does She Think She Is?